Morton has a signature guitar deal with Jackson. He is the most reserved, introverted member of the band, and admits that he doesn't feel comfortable in the public eye. Aside from guitar, he's an avid wine enthusiast, a cigar aficionado, as well as an amateur race car driver. In their DVD release, Killadelphia, he got into a fist fight in which he bested liquored-up vocalist Randy Blythe. Mark Morton, Chris Adler and John Campbell formed Lamb of God in 1990 at Virginia Commonwealth University where they were floor mates. When Morton left to pursue a master's degree, the band found a new guitarist, Abe Spear. When the band decided to retire from its purely instrumental sound, they added vocalist, Randy Blythe. At this point, they were known as Burn the Priest. Morton re-joined the group and Burn the Priest released a self titled full length album soon thereafter. He cites Jeff Loomis as one of his inspirations. As Morton frequently uses pentatonic scales and harmonic minor scale, it has been noted that he has a blues style to his music. 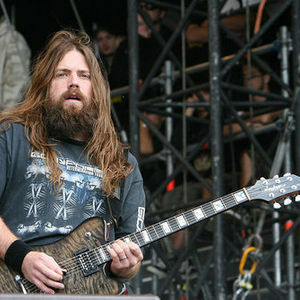 He plays almost all of Lamb of God's guitar solos and forms most of the heavy groove rhythms. Co-guitarist, Willie Adler, plays most of the fast picked and staccato riffs. His gear consists of varius Framus Guitars, Gibson Les Pauls and as well as his own signature model, The Jackson MM1 Dominion strung with GHS Boomer Strings 10-46 tuned to drop-D, loaded with Seymour Duncan 59 pickups, although the band does endorse EMG's. Onstage, Mark uses two Mesa Mesa Mark IV amplifiers with nine Mesa 4X12 cabinets (only two of the cabinets actually have speakers in them, the other seven are for show). His rack gear includes a Sennheiser wireless system, a DBX compressor which he uses as a noise gate, and a splitter box which divides his amplifier channels to the cabinets. Mark only uses a few pedals on stage, Original Crybaby Wah Pedal, MxR Eddie Van Halen Phaser which "makes his solo's sear", MxR Overdrive pedal, and a boss tuning pedal. He has also been credited to some of Lamb of God's albums, specifically New American Gospel under his middle name only, Duane. Morton is known for writing Lamb of God's more over-the-top songs. These include "Redneck", "Descending", "Vigil", and "Remorse is For the Dead". He has recently worked with underground emcee/producer Necro for his upcoming album entitled Death Rap.